A blog about exploring civility in today's society. Watching Random Acts of Kindness videos is by far one of my favorite pass times. But, not just because of the feel good moments. I love it because it inspires me to get out and do something good for a perfect stranger. There are things that everyone can do to improve the lives of others. The most important things are those little surprises of kindness. I think these mean the most to me and inspire me so much because it really makes the world feel so small. It makes you care about a person you’ve never seen before or might never see again. It puts compassion and humility into the world and makes it a completely awesome place to be. The news covers some horrific and unfortunate tragedies. As we all know, at times they are very hard to watch. Things like violence, cruelty, and murder make me confused and sick to my stomach. But, as bad as these things are there are always counteracting stories and people who will never stop being good to others. These are the people I want to highlight. These are the people I want to dedicate this post to. These are the people I admire whole heartedly. I hope everyone wants to be a little more like these incredible people who will help you in a time of need, surprise you when you’re feeling down, give a selfless random act of kindness to help someone they may never know. In my opinion, the idea of doing something small yet kind for someone else for the pure joy of brightening their day is one of the greatest pleasures of life. 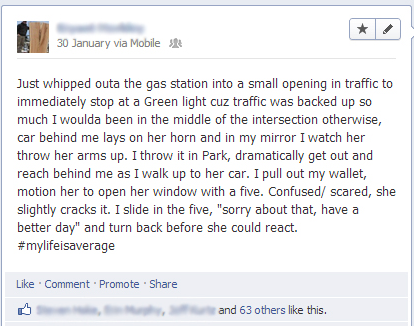 And watching these heart warming videos on YouTube of people doing random acts of kindness takes second best. The internet is filled with intense videos of human compassion that will absolutely leave you speechless (even me–and that’s hard to do!) and wanting more. So go on and check it out. Go get inspired. Go do great things. I love the internet: R.A.K. There are 10,500,000 results when you google “Random Acts Of Kindness” and I bet each one of those links would not only put a smile on your face, but inspire you to go out and do your own random act of kindness. 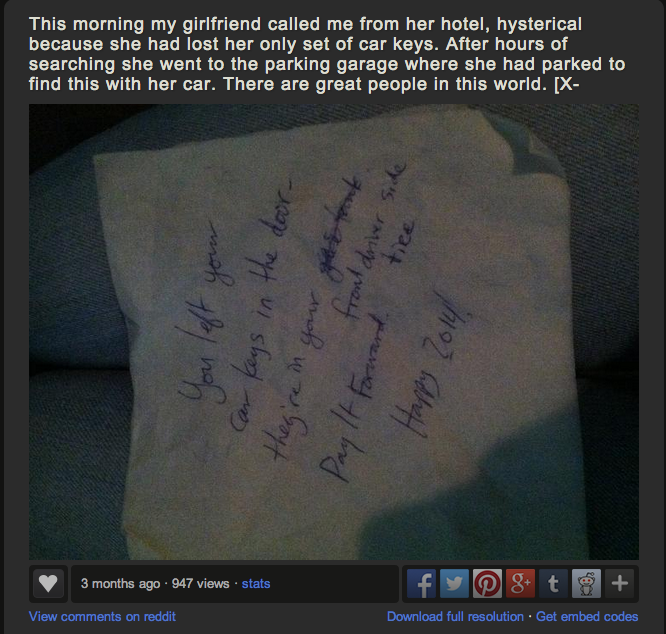 These are such beautiful, caring and unexpected things to do. This entire “sub-reddit” just makes me want to be a better person. I feel the same way when I watch “Random Acts of Kindness” videos on YouTube. There’s a really good one where a guy spends his 22nd birthday doing “22 Random Acts of Kindness” in Islamabad, Pakistan. I hope after viewing these random acts of kindness on reddit and YouTube everyone will want to complete a random act of kindness. 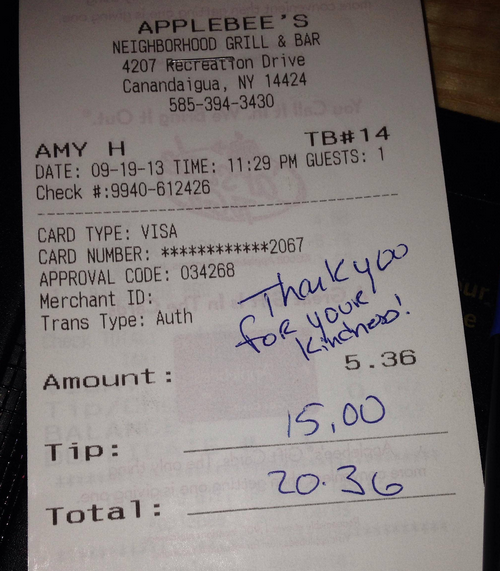 I want to hang out with people that do these types of things for others just because it’s a good thing to do. 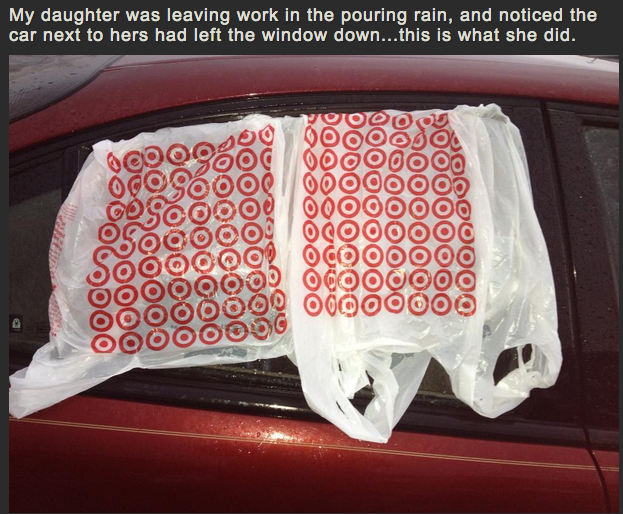 I want to inspire people to do these random acts of kindness by doing them myself. 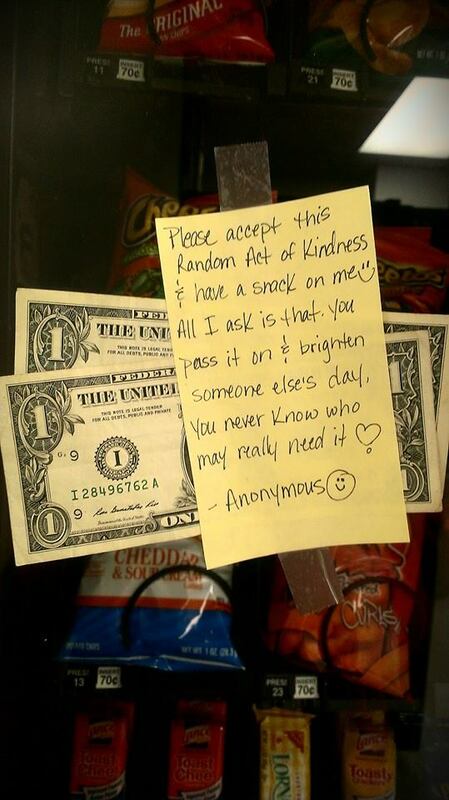 I think the world would be a much better place if everyone did random acts of kindness more often. Annnnndddd. I know the best way to get started! “The Random Acts of Kindness Foundation” is dedicated to “inspiring people to practice kindness and pass it on to others” and it seems like a pretty fantastic organization. They have a calendar on their website called the Kindness Calendar and there is a random act of kindness for you to do every single day of the year! How neat is that?! So watch these videos, be inspired, and go do some random acts of kindness. I promise it will make you feel so great about your life and definitely make the other person super happy as well! Because, let’s be honest, who doesn’t love a little R.A.K.? For more information about “The Random Acts of Kindness Foundation” you can check out their homepage by clicking here. Something really great happened in Quincy, California last month. So, these police officers decided to try to change people’s minds. They had a little help from their friends Wall’s Ice Cream. The police officers pulled people over driving in Quincy for “being too serious.” It was great. Greg Hagwood is the Plumas County Sheriff he’s been with the Sheriff’s department for 26 years. I think it’s safe to say this was one of his favorite days on the job. Sheriff Hagwood and a few other police officers started out by pulling cars over. Then they walked up to the vehicle and asked, “Are you familiar with vehicle code 339472?” Obviously all the participants had no idea what he was talking about. He then asked, “How many people do we have on board?” The people were so confused when they answered the officers. The police officers excused themselves for a moment, went to their cars and came back with … ICE CREAM! What?! The officers got all kinds of responses from the unknowing citizens, one girl was even in tears. The idea of surprising these random people throughout the day is such a great idea. I definitely wouldn’t mind if a police officer pulled me over for doing nothing wrong and then gave me ice cream. I don’t know about you but that would absolutely make my whole day! I think I would be inspired to give out free ice cream to perfect strangers. 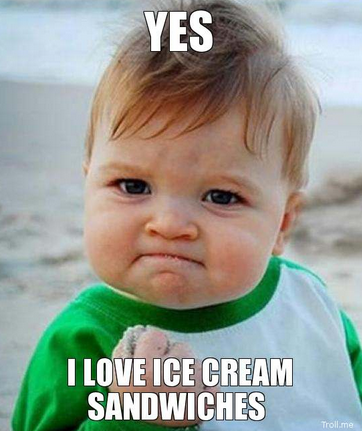 Because, let’s be honest, who doesn’t like ice cream. Okay, okay minus people who are lactose intolerant. But, that’s why we have Sherbet.